A better option than using carrier voice mail on your Droid X is to set up and use Visual Voice Mail, a feature on the Droid X that provides more flexibility than standard carrier voicemail when dealing with missed calls. The only drawback to Visual Voice Mail is that it costs extra. You must subscribe to the service, which runs about $2.99 per month. Touch the Launcher button to pop up the list of all apps installed on your phone. Touch the button labeled Subscribe to Visual Voice Mail. Review the license agreement, then scroll down and touch the Accept button. Input your existing voicemail PIN and then touch the Login button. If it works, you’re done. If not, you have more setup to do. Touch the OK button to start the provisioning process. You may be asked whether you want to subscribe to Premium Voice Mail, which you don’t need if you want to use the basic Visual Voice Mail service. Press the Back soft button to exit the last setup screen. It may take a few moments for Visual Voice Mail to be configured. When it’s ready, the Visual Voice Mail notification appears on the status bar. Visual Voice Mail serves as your access to all voicemail left on your phone. After it’s configured, you never need to dial your carrier’s voicemail again. Simply pull down a Voicemail notification or start the Voicemail app, and all your messages are instantly available on the screen. When new voice mail arrives, the notification icon appears. The number in the icon indicates how many new messages are available. To access your messages, pull down the notifications and choose Voicemail. 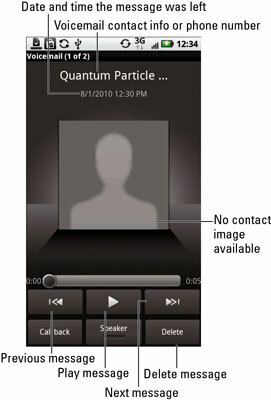 The Visual Voice Mail screen appears. Play/Pause: Listen to the message. You can pause a message while its playing by touching the Pause button (which replaces the Play button while a message plays). Call Back: Call the person back. Erase: Delete the message. You then have to touch the OK button to confirm. Back: Press this soft button to see a visual voicemail inbox, where all your voice mail messages are listed. Choose a message from the list to listen to it, delete it, or return the call. Visual Voice Mail uses the same default greeting that your carrier voicemail did. To change the greeting, you have to dial carrier voicemail and follow the menu prompts.